I haven’t been in the kitchen for six days and these have been on my list for awhile – glad I finally made them. Three ingredients! You can’t beat that, huh? Very easy and their taste was super close to the real thing. Line a 8″ square pan with wax paper. In medium bowl, melt choc chips in microwave at 50% power for 30 seconds. Stir and return to microwave for 30 more seconds at 50% power. If chocolate is still not melted completely – continue heating it at 10 second intervals at 50% until smooth. Let it cool a bit so you don’t melt everything into a sludge. Using an electric mixer on high speed, beat your melted chocolate for 30 seconds. Add the Cool Whip to melted chocolate and beat just until combined and fluffy -30-60 seconds. Spread evenly into prepared 8×8′ pan. Place in freezer for about 30 minutes (overnight might even be better). Remove from freezer, remove candy from pan and cut into squares. Return back to freezer. I worked in small doses so I could keep them hard and easier to work with. Melt candy wafers in microwave following package directions. Take out frozen squares and dip into melted chocolate. Place on baking tray lined with wax paper. 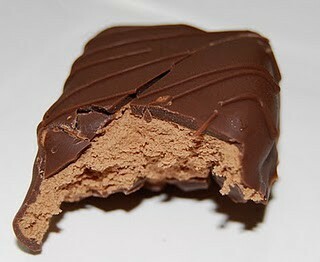 Allow chocolate to set up in refrigerator or freezer. Store in airtight container in refrigerator or freezer.